Chapter IV of Sikh Rahit Maryada which deals with Gurdwaras and the maryada to be followed there lays down quite unambiguously therein that no book (pustak) is to be installed at par with Sri Guru Granth Sahib ji. (ਸ੍ਰੀ ਗੁਰੂ ਗ੍ਰੰਥ ਸਾਹਿਬ ਜੀ ਦੇ ਵਾਕਰ ਤੁੱਲ ਕਿਸੇ ਪੁਸਤਕ ਨੂੰ ਅਸਥਾਪਨ ਨਹੀਂ ਕਰਨਾ). This is the mandate of the panth and ought to be honoured by each and every one. The text and its intent are awfully simple and there is no scope of any confusion about it. But lately it is seen that this simple clause is being distorted and misinterpreted. Hence this sincere effort to clear the doubts. First of all this provision in the Sikh Rahit Maryada is about the maryada that is to be followed in the Gurdwaras. There is an obvious difference between a Gurdwara and a Takhat and their maryada. A Takhat is not a Gurdwara and vice versa. Sachkhand Sri Harimandir Sahib is a Gurdwara and Sri Akal Takhat Sahib is a Takhat, hence the difference in the maryada of these two most pious institutions of the panth. The maryadas of these two institutions, though mutually exclusive are complementary to each other. This is what embodies the Miri-Piri and Sant-Sipahi concept of the Khalsa. Sachkhand Sri Harimandir Sahib was there but still Guru Hargobind ji gave to the panth Sri Akal Takhat Sahib. Whatever could not be said or done in the Harimandir Sahib was said and done at Sri Akal Takhat Sahib. Sri Harimandir Sahib was the seat of Sri Guru Granth Sahib and Sri Akal Takhat Sahib became the seat of the nagaras, and shastras. 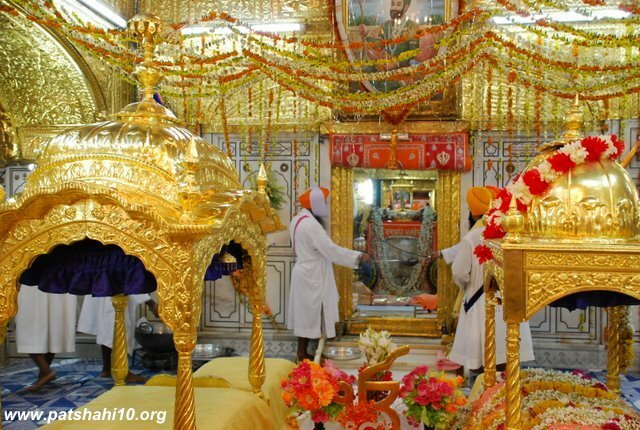 It is not surprising thus that whereas in any Gurdwara the throne or singhasan is designated for the parkash of Sri Guru Granth Sahib but the throne or singhasan at every Takhat, be it Sri Akal Takhat Sahib, Kesh Garh Sahib, Patna Sahib, Hazur Sahib or Damdama Sahib does not have the parkash of Sri Guru Granth Sahib, rather it has the display of the weapons and arms of Guru Sahibs and other warriors. At Akal Takhat Sahib, as in every other Takhats, the parkash of Sri Guru Granth Sahib Ji is on the side of the main singhasan. And this is the unique concept and an intriguing relationship between a Gurdwara and a Takhat which has hardly been addressed and understood. The Granth of the Sikhs that embodies the warrior spirit of the Khalsa is Sri Dasam Granth Sahib. 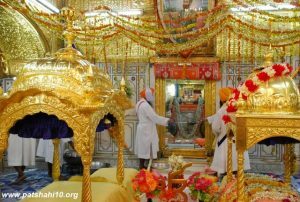 Hence, it is not an exaggeration to propose that Sri Dasam Granth Sahib has the same status with relation to Sri Guru Granth Sahib what Sri Akal Takhat Sahib has to Sri Harimandir Sahib. Interestingly, maybe it is for this reason that at Hazur Sahib the palanquin (palki) that has the parkash of Sri Guru Granth Sahib has the design of the dome of Harimandir Sahib and the one having the parkash of Sri Dasam Granth Sahib has the design of Akal Takhat Sahib. Also the palki having the prakash of Sri Guru Granth Sahib is much bigger in size than the one having the prakash of Sri Dasam Granth Sahib. At every Takhat, though the parkash of Guru Granth Sahib is there but it is not on the main seat or singhasan, but at a lower level. This decision was not made by the Sikhs but by the divine wisdom of the Guru. There is no denigration here but the true philosophical spirit of the proper appreciation of the status of a Gurdwara and a Takhat. The Guru’s wisdom has to be understood and applied in its true perspective. Parkash of Sri Guru Granth Sahib and Sri Dasam Granth Sahib at Takhat Sri Hazur Sahib. Even the shape, size and structure of the palkis are conspicuously different and symbolise the embodiment of Sant Sipahi concept of the Khalsa. Coming back to the provision of Sikh Rahit Maryada that no book (pustak) is to be installed (asthapan) at par with Sri Guru Granth Sahib ji, there is no denying that Khalsa is the creation of two source granths Sri Guru Granth Sahib and Sri Dasam Granth. To initiate a person into the fold of Sikhism and to make him remain in this fold the banees of amrit sanchar and nitnem are required and the sources of these are the two pious granths. We as Sikhs don’t address our granths, Sri Guru Granth Sahib and Sri Dasam Granth as mere books. Lately, some anti-Sikh forces have misused and misinterpreted this clause of Sikh Rehat Maryada and have used it as a tool to attack the banees of Sri Guru Gobind Singh Sahib contained in Sri Dasam Granth. Notably, whereas in Hinduism an idol or book is installed but in Sikhism such installation is neither permitted nor takes place. Parkash simply means to open a granth for the purpose of reciting (ਪਾਠ), studying (ਅਧਿਐਨ), teaching (ਉਪਦੇਸ਼), and discourse (ਵਿਖਿਆਨ). Without opening or parkash of the granth, none of the above can be done. So the usage of word parkash should not be narrowed down literally otherwise if we say that in the presence of Sri Guru Granth Sahib nothing else can be parkashed then will it bring the dahrha parkash (flowing beard) under its mischief too? There are mandates given in rahitnamas to recite and memorize the banees from these two pious granths. ਦੁਹੂ ਗ੍ਰੰਥ ਮੈ ਬਾਣੀ ਜੋਈ॥ ਚੁੰਨ ਚੁੰਨ ਕੰਠ ਕਰੇ ਨਿਤ ਸੋਈ॥ (ਰਹਿਤਨਾਮਾ, ਭਾਈ ਦੇਸਾ ਸਿੰਘ) For this, obviously the parkash of granths has to be done. Hence the provision given in the Sikh Rahit Maryada that “no book (pustak) is to be installed at par with Sri Guru Granth Sahib ji (ਸ੍ਰੀ ਗੁਰੂ ਗ੍ਰੰਥ ਸਾਹਿਬ ਜੀ ਦੇ ਵਾਕਰ ਤੁੱਲ ਕਿਸੇ ਪੁਸਤਕ ਨੂੰ ਅਸਥਾਪਨ ਨਹੀਂ ਕਰਨਾ)” does not apply here because there is no installation (asthapna) of a book (pustak) at all. Rather the parkash is done for recitation and memorization as per the commands of the Guru. 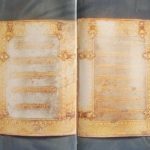 There are certain respected jathebandis such as Nihangs and Damdami Taksal who do the parkash of Sri Dasam Granth Sahib but do ensure that the solo parkash of Sri Dasam Granth Sahib is not done. The parkash of Sri Dasam Granth is always done in the presence and auspice of Sri Guru Granth Sahib. This gesture in itself ensures supremacy of Sri Guru Granth Sahib and is a declaration that there is only one Guru and that is Sri Guru Granth Sahib ji. Hence the parkash of Sri Dasam Granth is a non-issue. And surprisingly enough this issue has suddenly germinated under the patronage of a controversial ragi when the panth is concentrated on celebrating the tri-centenary of the Guruship to Sri Guru Granth Sahib. The whole hue and cry by certain quarters regarding the parkash of Sri Dasam Granth is nothing but a calculated move motivated by mischief and is void of any logical discourse. And this mischief is often cashed by instilling the pseudo fear of challenge to the supremacy of Sri Guru Granth Sahib. The supremacy of Sri Guru Granth Sahib is eternal and the prakash of Sri Dasam Granth when done in the presence of Sri Guru Granth Sahib only ensures and reiterates this supremacy. The uncontroverted fact is that Sri Dasam Granth Sahib is the assurance of the separate entity of Khalsa, and the real ulterior motive of the blasphemous anti-panthic forces raising the hoax of parkash is basically to disown and wean away the Sikhs from the powerful banee of Guru Gobind Singh ji, thus making the Khalsa a real and reformed Hindu. According to Kesar Singh Chibber, Guru Gobind Singh Sahib had himself defined and explained the relationship between Sri Guru Granth Sahib and Sri Dasam Granth. And this Guru-vaak should be our guiding force.